So, it's a 1/7, but it attacks as a 7/1? Not too exciting, but I like it. It's a wall, until you need to attack with it, and then it becomes a Zektar Shrine devotee. Of course, a 1/7 isn't really worth five mana, and a 7/1 is disappointingly easy to kill just by chump blocking. If it had trample or first strike, or even just haste, I'm sure folks all over would jump at the chance to cast a Fireboar, but this seems like it just doesn't do quite enough. Or, rather, it does plenty of different things, but isn't good enough at them. I don’t know about you guys, but I just thought of the Norse god Freyr and his pet boar. Valakut Fireboar may not have the ability to run over water as though it were land, but it does plenty to make up for it, playing both offense and defense very effectively. I can’t remember the last time I said that about a red card. This card is sure to be a hit in draft, and even if it never makes the top tables of constructed, it does funny stuff with Fatal Frenzy. It need trample. Trample would make this card better. I like the flavor text. Overall this set is going to have some great new abilities that I cannot wait to try out. 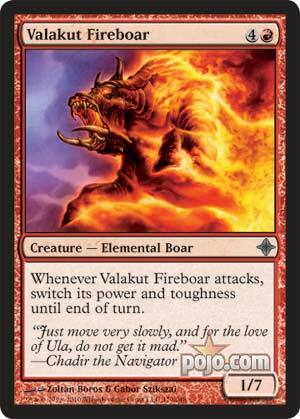 Welcome back readers today’s card of the day is Valakut Fireboar an interesting creature from Rise of The Eldrazi. Valakut Fireboar is a 1/7 creature for four mana whenever it attacks you switch its power and toughness until end of turn. This review will be short this card is only good when your attacking against an open field otherwise it will be chumped blocked and unlike cards like Ball Lighting this card doesn’t have haste nor does it have trample. In standard and extended this card won’t see play even if you find a way to pump its attack up so it could become a huge 7/7 creature it takes a mana investment and Fireboar is still a vanilla creature. In eternal this card won’t see play either. In casual and multiplayer this card could stick around if you get it out early and hit a few players. In limited this card can take out a few creatures and be an ok attacker. Overall this card wont see much play although it is an interesting card.